Mrs M. GOW (mother), 1 Grey Street, Timaru. Later of 49 Elizabeth St, Timaru. Height 5 feet 5 inches. Weight 130 lbs. Chest measurement 32-34 inches. Complexion dark. Eyes brown. Hair black. Sight and hearing both good. Colour vision correct. Limbs and chest well formed. Full and perfect movement of all joints. Heart and lungs normal. No illnesses. Free from hernia, varicocele, varicose veins, haemorrhoids, inveterate or contagious skin disease. Vaccinated. Good bodily and mental health. No slight defects. No fits. Deemed fit. 8 July 1917 - slightly wounded but remained with his unit. Tyne Cot Memorial, Tyne Cot Cemetery, Zonnebeke, West-Vlaanderen, Belgium; Palmerston Cemetery (Otago) - memorial on parents' headstone. N. Z. Apse, Panel 1. Palmerston Cemetery - Block 55, Plots 10, 11, 12. 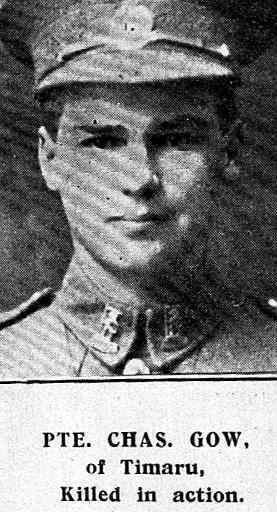 Charles Gow (Charlie), born on 19 October 1895 at Palmerston, Otago, was the third son of John Cowie Gow, of Shag Valley Mills, Palmerston, and Marjory (née Davie) Gow, of 48 Elizabeth Street, Timaru. His father John of Aberdeenshire, Scotland, who had come to New Zealand in 1880 and was initially engaged in milling on the Water of Leith, Dunedin, married Marjory Davie, also of Aberdeenshire, in 1881 at Dunedin. After a time near Oamaru, He was engaged in the management of Shag Valley Mills before purchasing the mill. It was while at Shag Valley that Charles was born, the sixth of their seven children. Charlie was educated at Palmerston School, along with several of his siblings. There in 1909 he was successful in the Proficiency examinations. John Cowie Gow was very active in public affairs in the Palmerston area. For many years he was the Mayor, being re-elected several times. In 1900 Mr J. C. Gow, Mayor of Palmerston, sent a message of regret at being unable to attend the departure of troops for South Africa. “May the Lord protect our gallant New Zealand boys.” He led an enthusiastic committee in canvassing for contributions to the patriotic fund and encouraging for volunteers to serve. The stone laid to support the Waihemo district monument to the Boer War soldiers was laid ny the Mayoress, Mr J. C. Gow in 1902. How Mrs Gow must have reflected on that occasion some 14 years later when she was lose her own son to the ravages of war. Mr Gow was instrumental in inaugurating a water supply scheme and offered his services to pump water to town of Palmerston at very low cost. Unfortunately he died soon after, and there were again supply problems. He was also prominent in Lodge affairs and the Palmerston A and P Society, served as chairman of the Palmerston District High School committee and was a trustee of Palmerston South Volunteer Drillshed Reserve. Mr J. C. Gow, a most enterprising and greatly esteemed resident of Palmerston, died on 27 October 1904 after a brief illness. In December 1905 Mrs J. C. Gow contributed to Dunedin Hospital Extension Fund. After leaving school Charles moved to Timaru, with his mother, sisters and younger brother. In Timaru he was a regular in the Cambridge hockey teams, playing for the juniors in 1913 and again in 1914. He played in the third grade at the South Canterbury Hockey Association’s annual tournament in 1913, which promised to be a good day with record entries and a grand concert and social to follow. And in August 1915 he was a member of the Cambridge Junior A team in the five-a-side tournament. Earlier in 1915 Charlie made an appearance in a striking and original costume – “”Masher” - at a fancy dress and masquerade ball held to support the Ballantynes’ candidate in the Queen of the Carnival contest. A year later Charles Gow, living at home in Timaru, enlisted and nominated his mother as next-of-kin. He had already served with the 2nd South Canterbury Regiment (Territorial force). He had been rejected previously for the military forces because of Hydroceole and operated upon on 10 February 1916. On 23 August 1916 South Canterbury’s quota for the 20th Reinforcements left for camp by the second express north. They were entertained at luncheon at Stafford Tea Rooms and addressed by several dignitaries before marching from the Drill Shed to the railway station, accompanied by the 2nd South Canterbury Regiment Band, Senior Cadets, and Honorary Territorials. Private C. Gow, on final leave in November, was given a send-off by friends in the Arcade Cafe, with presentations and good wishes for a safe return. Having embarked from Wellington with the Rifle Brigade on 30 December 1916 on the “Athenic”, he disembarked at Devonport on 3 March 1917, when he marched in at Sling; he marched out to Codford exactly a month later and was posted to the 3rd Company of the Auckland Regiment as a Private before leaving for France on 28 May 1917. He was slightly wounded in the Field on 8 July 1917 but was able to remain with his unit. Just three months later he was killed in action in one of the Ypres offensives in Belgium - on 4 October 1917 - just 15 days short of his 22nd birthday. “Somewhere in France” the notice in Timaru and Otago papers read, “So loved, so mourned.” News of his death was intimated very soon after to his oldest brother George of Eltham and another brother Alexander of Oamaru, and to his many friends in Timaru. His was one of about 230 deaths recorded in Casualty List No. 694. He was buried near Otto Farm, probably close to where he fell. One of the hundreds whose bodies were not recovered, Charles Gow is remembered on the Tyne Cot Memorial, Tyne Cot Cemetery, Zonnebeke, West-Vlaanderen, Belgium. Charles Gow had been a jeweller/watchmaker, at the time of enlistment and was employed by Mr McBride to whom he was apprenticed. He was well known in the Boy Scout movement and was the Assistant Scoutmaster of the Main School Troop in Timaru. The troop was to have held a social meeting on 20 October 1917, but it was put off out of respect for Private Gow. The headmaster of the Timaru Main School reported with regret at the October School Committee meeting the death two more former pupils, Charles probably a pupil only in that he led the Scout Troop. At the Timaru Main School annual meeting of householders in April 1918, sympathy was expressed to the parents and relatives of this ex-pupil. Both George and Alexander died in 1920, leaving only Walter, the youngest of four brothers to survive their mother who died in 1947 at Timaru, and two of three daughters. The name of Private Charles Gow is inscribed on his parents; headstone in the Palmerston Cemetery. He is honoured on the Timaru Memorial Wall and the Chalmers Church Memorial.